A shift towards greater electrification combined with other safety and technology demands will force BMW to further lightweight its vehicles, an expert for the OEM said this summer. 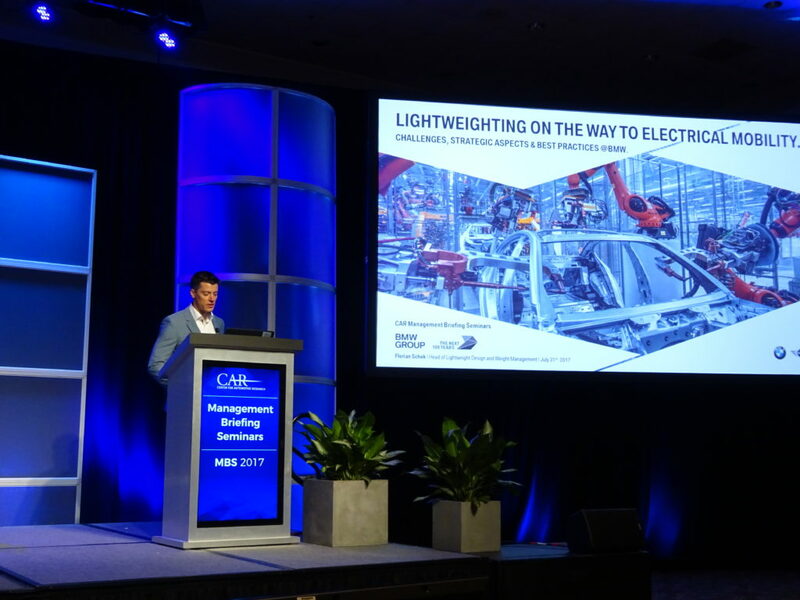 “We see … really tremendous weight coming to the cars,” BMW head of lightweight design and vehicle weight Florian Schek said July 31 at the Center for Automotive Research’s Management Briefing Seminars. Schek’s forecasts might apply to other global OEMs as well — which mean that it’s not just BMW-certified shops who ought to pay attention. For example, Volvo and Jaguar Land Rover have announced plans to convert all of their vehicles to mild or plug-in hybrids or go completely electric, and Schek said it was pretty clear that the internal combustion was “not the future” given global regulations. “It might be the end of the powertrains as we know them,” said Florian Schek, head of lightweight design and vehicle weight for BMW. Regulators worldwide are forcing the change to greater electrification, but Schek said BMW research also saw consumers thawing to the idea of plug-in hybrids and battery-only vehicles. In 2016, 17 percent of U.S. customers preferred the idea of a PHEV for their next purchase, up from 6 percent in 2014. Once a U.S. consumer buys a PHEV or full-battery-electric vehicle, they’re more inclined to buy another, according to BMW’s research. Unlike a traditional “mild hybrid” like the Toyota Prius, plug-in hybrids (like the Prius Prime) have an externally chargeable battery useful for a couple dozen miles but also an internal combustion engine. The idea is that a consumer could run a day of errands in-town without ever using any gas but still have the traditional engine for distance driving. Schek predicted that by 2025, 15-25 percent of all BMW sales would be either plug-in hybrid or fully electric vehicles. The company in July announced an architecture flexible enough to offer PHEV or completely electric powertrains on every brand and model series. Unfortunately, these alternative powertrains and other 21st century automotive demands can add enough weight to exceed the parameters set for the architecture. “Lightweighting is crucial to BMW, especially since we need the benefits from lightweighting to meet our product characteristics,” Schek said. The fruits of this lightweighting might not be as obvious based on curb weight alone. BMW has resigned itself to a future of “no lighter cars anymore,” where the OEM works hard on lightweighting a vehicle body just to offset the new mass introduced by another piece of technology. For example, he said the next-generation 7 Series and 5 Series were about as optimized as the cars could get. “The development will add weight and we cannot compensate … completely,” Schek said. Learn about lightweighting and joining lightweight materials during SEMA with Ken Boylan of Chief at “Current and Future Technologies 2017 and Beyond”; Toby Chess of Kent Automotive at “Adhesive Joining in Modern Repairs”; Dave Gruskos of Reliable Automotive Equipment with “Get Attached to Following Procedures: A Comprehensive Guide to OEM Joining”; and a panel of OEM Collision Repair Technology Summit experts at “How Automotive Research is Driving Change.” The sessions are part of the Society of Collision Repair Specialists Repairer Driven Education Series Oct. 30-Nov. 3. Register here for individual classes or the series pass package deal, which includes the entire week of classes, all three parts of the OEM Summit and the Nov. 2 Sky Villa afterparty. Schek presented data demonstrating the issue. A BMW 530i weighs 3,395 pounds, and its internal combustion engine powertrain makes up 930 of those pounds. 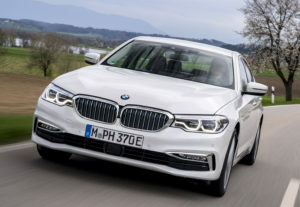 But a plug-in hybrid BMW 530e iPerformance’s powertrain weighs 1,320 pounds, leading the car to exceed the parameters of its architecture. “You really have to reduce that,” he said. Scheck said. Future battery electric vehicles could have powertrains weighing between 1,320-1,980 depending on what kind of range is desired, according to Schek’s presentation. The U.S. might not go electric as quickly as other nations. Gas is cheap, regulators aren’t as aggressive, and there’s not the kind of air pollution issue of a country like China — which Bloomberg reported Sunday will eventually ban gas and diesel engines. However, other technology can still add more weight which must be offset to the future American fleet. Protecting occupants from a small-overlap crash test adds about 33 pounds of weight, according to a slide Schek shared. A 48-volt electric system adds 77 pounds. Basic emission-controlling efforts like RDE and AdBlue add 44 pounds and 66 pounds, respectively, and other future emissions control technologies can tack on 55 pounds. Further into the future, Level 4 self-driving capability contributes a new 110 pounds of mass into a vehicle. Based on Schek’s presentation, while BMW might have fewer “we just cut triple-digit weight” announcements for future vehicle generations, shops shouldn’t be lulled into thinking no lightweighting occurred between the two editions. Keep learning and equipping for the repair, replacement and joining of higher-strength steel, aluminum and perhaps other substrates — and consider boning up on electrical powertrain safety as well.